There's no shortage of information on the topic of lead nurturing. Just plug the term into Google, and you'll find pages of tips, tricks, and best practices designed to help B2B marketers better understand the concept and how to best implement it. While it's exciting to see the plethora of lead nurturing best practices available today, it can also be somewhat overwhelming to process and difficult to identify which strategies are right for your business. The Definitive Guide is designed to be informative and practical. It offers useful, qualitative insight from today's marketing thought leaders, basic and advanced best practices on must-have lead nurturing campaigns, and worksheets for calculating ROI and ensuring the impact of lead nurturing done well. 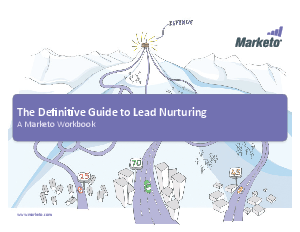 Use this guide as a workbook - take notes, highlight what you find inspirational, share what you learn with your colleagues, and start driving explosive revenue growth with lead nurturing.